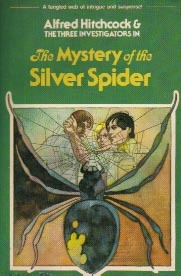 Trade Edition First Printing Identifier: Lists to "The Mystery of the Silver Spider" on the back cover. First Printing Identifier: 1234567890 numberline on the copyright page. 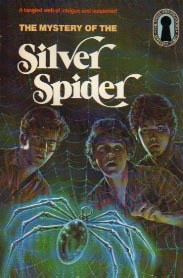 Notes: This title with the Marchesi Cover art was printed at least up through 1983 and possibly into 1984. 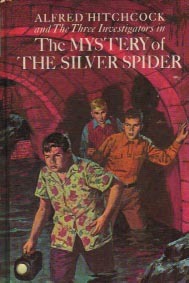 Later printings of this edition as "Hitchcock Cover Paperbacks" are not known to exist. 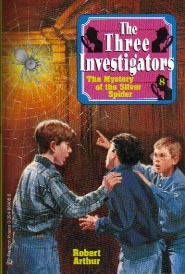 If they do, they will have Robert Adragna cover art with the Hitchcock silhouette in the upper right corner and the book would most likely contain the Harry Kane internal illustrations. First Printing Identifier: 12 11 10 9 8 7 6 5 4 3 2 1 numberline on the copyright page. First Printing Identifier: 6 7 8 9 0 numberline on the copyright page. 1.) Confusion Alert! 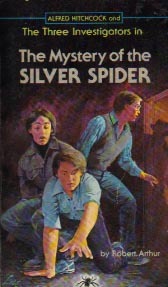 This title is a continuation of the Revised "Keyhole" Paperback Edition (which had 5 printings) but with new cover art. The ISBN's are the same and the same printing plates were utilized. Back to the Original Series page.